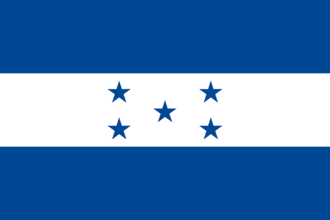 Honduras is a small nation in Central America. It is bordered by Guatemala to the north and El Salvador and Nicaragua to the south. Its 3 provinces are plains mountains and jungle. Honduras, lacking a unique national focus tree, uses the generic national focus tree instead. Honduras starts with 2 research slots. Honduras is guaranteed by the United States via Monroe Doctrine. Honduras may form the United States of Central America if it controls all other independent Central American countries excluding Panama. Doing so will give it cores on the required territories plus British Mexico (311). Honduras has 2 Civilian Factories and 1 Military Factory in the state of Honduras. It has 1 more building slot. Guatemala has a small military. Their Infantry has 4 units. They do not have a navy. Have a good strategy for Honduras? This page was last edited on 9 December 2018, at 08:21.